Let me just start by saying this; there are few things on the planet that are tastier than any form of enchiladas. They are one of my all-time favorite foods, right up there with tacos. 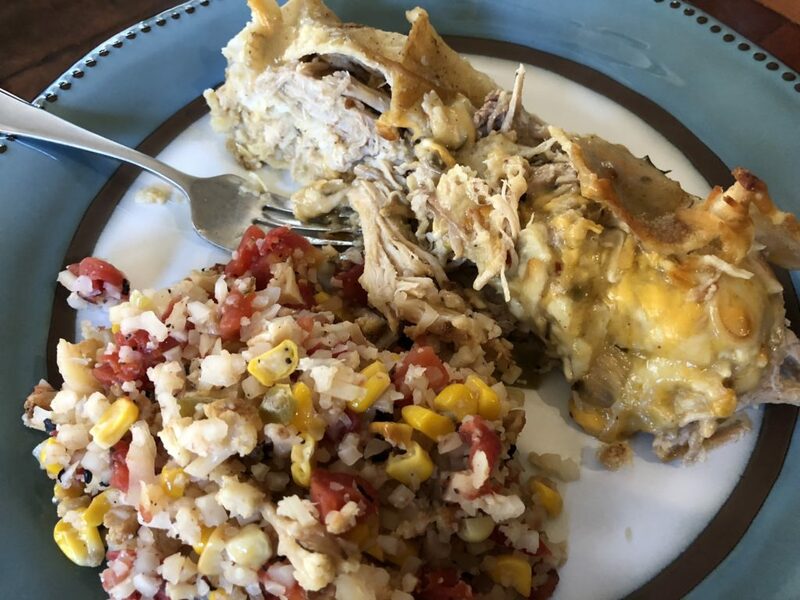 I mixed this one up by doing a casserole instead of rolled enchiladas, but you still get all the cheesy, saucy, porky goodness of an old school enchilada but it’s less work! Trust me on this on, you can absolutely make this and be the star of the day, and the day after, and the day after that! This casserole only gets better each day after you cook it up. This is a great dish to serve a large group, or throw a few in your freezer and pull it out for one of those easy dinner nights. You can’t mess this up! Ready to hear how to get this done? Okay, here goes…. Season the pork well with garlic salt, oregano, cumin, and pepper. In a large pot, sear the pork loin on all sides over high heat. Reduce heat and add the onion and one can of enchilada sauce. Cover and let it simmer for a couple of hours, or until it pulls apart easily. Once cool enough to handle, pull the pork into shreds. Taste the saucy pork and adjust seasonings to your liking. Set aside. In a large sauce pan, melt the butter over low-medium heat. When it’s melted, add the flour and whisk it in. When it makes a nice paste, add the chicken stock and whisk that in. Now add the other cans of enchilada sauce and simmer until it’s bubbly. Start by putting a ladle of sauce in the bottom of the enchilada pan. Tear the tortillas in half and lay down a layer. Top the tortillas with some of the shredded pork. Top the pork with shredded cheese. Add another layer of tortillas and top with sauce. 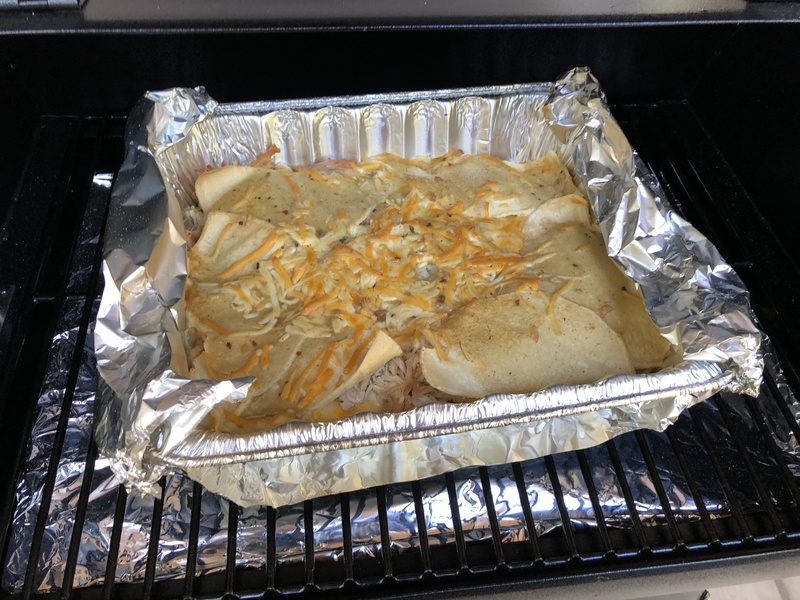 Layer pork, cheese, tortillas, sauce 3 times. Top with a little extra sauce. You can now put the casserole in a 350 degree oven until it’s bubbly, about 30-45 minutes. If you froze the casserole, pull it out and put it in a 375 oven until bubbly, 60-75 minutes. If you want to get crazy like we did, you can put on your Trager on smoke for an hour, then cook at 350 until bubbly. That adds a nice smoky flavor that’s pretty hard to beat! You can use pork, beef, or chicken for this casserole, as well. I like red sauce with beef or green sauce for pork and chicken. You can add a layer of vegetables also, I’ve used a saute of shredded zucchini, spinach and onion. You can skip meat all together and use all veggies, or just cheese. Top it with extra cheese, sour cream, avocado, pickled onions, salsa, pretty much whatever else you love!